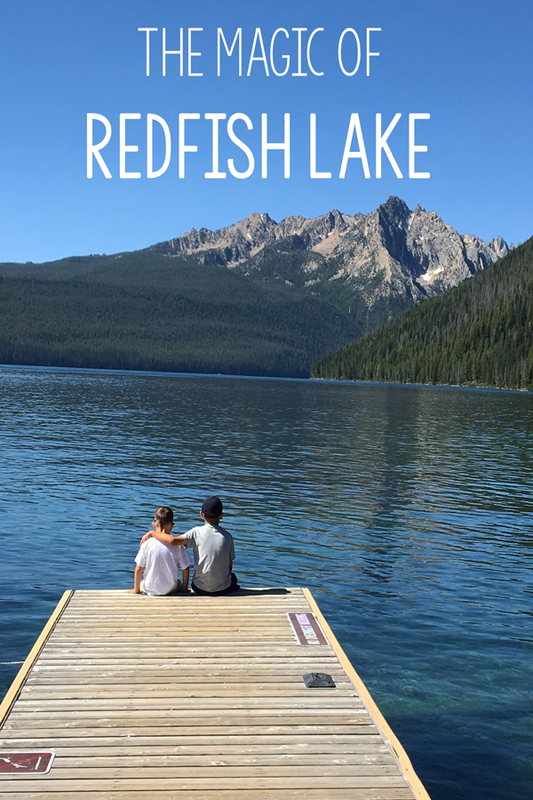 A trip to Redfish Lake is every wonderful thing a lake vacation should be. 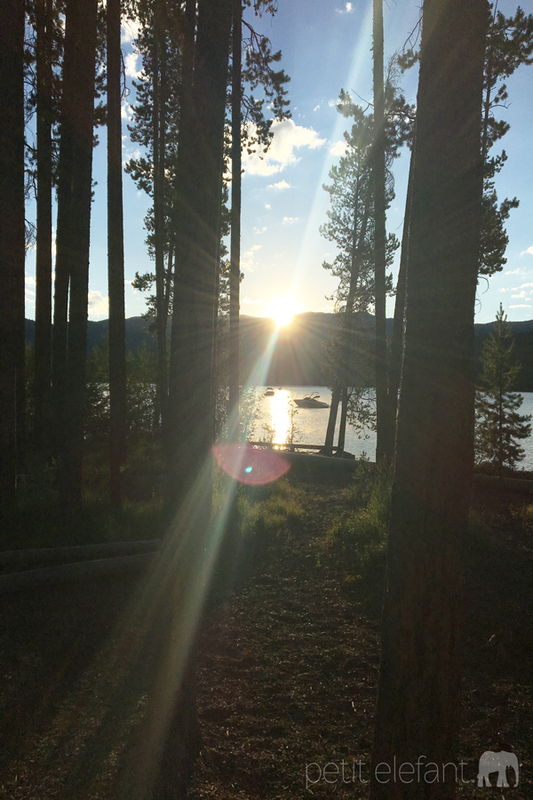 My little family recently spent 4 days camping in this Idaho wilderness, and it was bliss. For 4 solid days we didn’t think at all about politics, highlighting-and-contouring, calories, or Pokemon. Instead, we soaked up towering mountain peaks, a sparkling lake, and the sweet sweet smell of campfire. 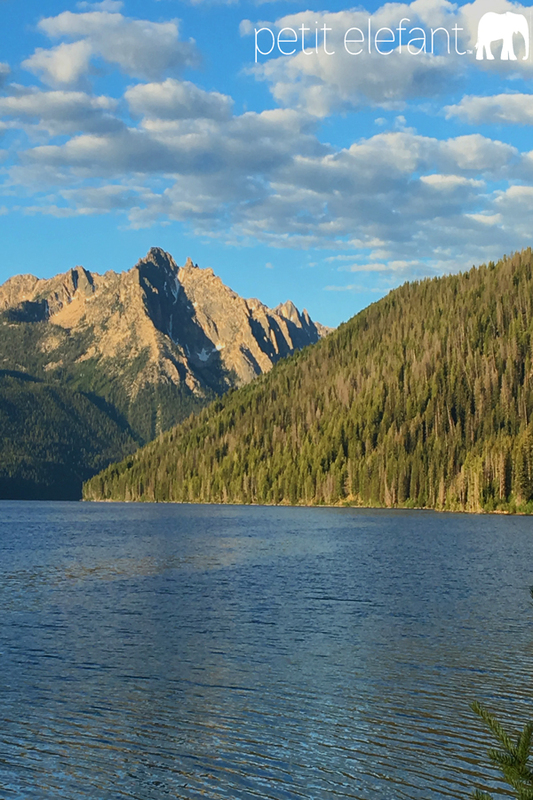 Redfish Lake, just outside Stanley, Idaho, is a beloved gem of a place, for both native Idahoans and long distance visitors. The kind of place families return to year after year. 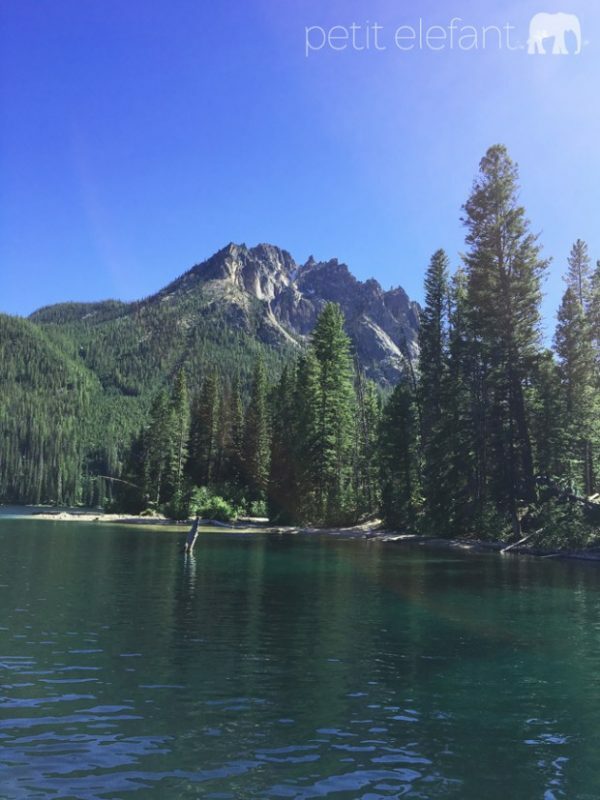 Nestled within the Sawtooth Mountains of Idaho, and cloaked in it’s own special kind of magic. These aptly named jagged peaks are brimming with pine trees, creeks, waterfalls, meadows, and crystal clear lakes with sandy shores. Breathtaking views and wonders big and small around every corner. Our little campsite sat right along the beach at Redifsh, beneath a canopy of fragrant lodgepole pines and blue blue sky. The morning sunrise beamed right across the glassy lake into our tent–a glorious way to wake up each morning. The days warmed up quickly, and the nights cooled to a lovely light chill–perfect for roaring bonfires, tinfoil dinners and s’mores. Nothing compares to the combination of a giant pearly white moon and twinkly stars peaking through the trees while the fire crackles and marshmallows roast. We followed the little path each morning directly from our tent down to a secluded quiet beach. 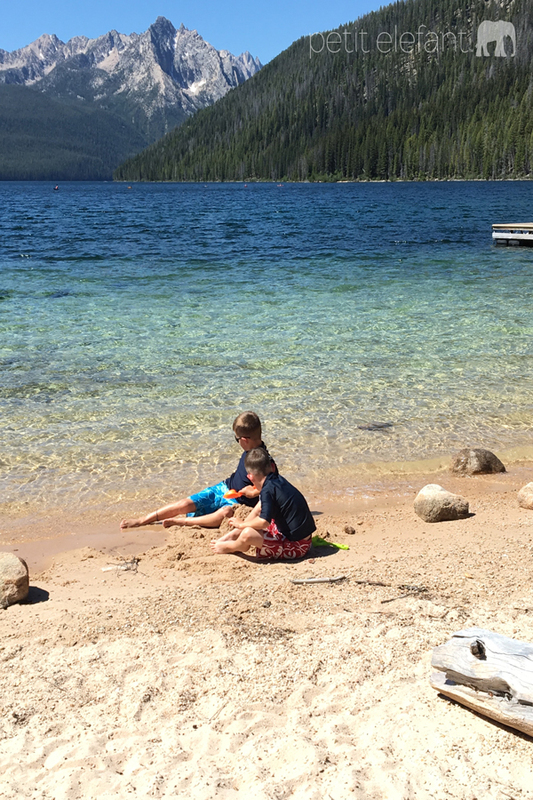 We splashed in the clear icy water, caught minnows in the shallows, played in the sand. Altogether a powerful magnet for my little boys. Many guests bring RVs and boats and the like, but all sorts watercraft can also be rented at the Marina. Paddle boats, canoes and kayaks, outboard motors and pontoons for big groups. The marina even offers boat shuttles up the lake, around the point to the inlet, where there are more secluded campgrounds and some petty fantastic day hikes. 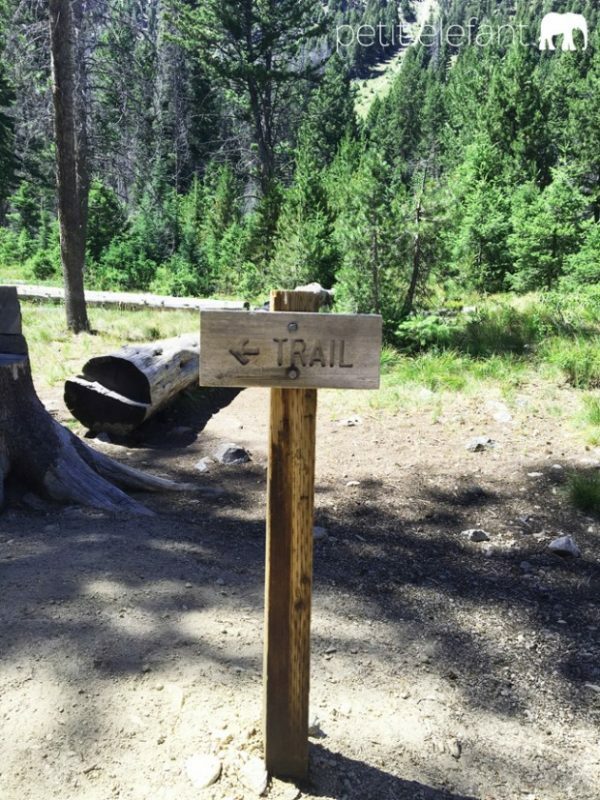 Also trailheads for some pretty rock climbing or backpacking trips deep into the Sawtooths. We took the shorter Lily Pond trail beneath the grand face of Mount Heyburn. Gorgeous. We then continued further up to an impressive waterfall, cascading down into rocky turquoise pools. Well worth the boat ride and the hike. This trail was sometimes a little steep, but not too long. Our 7 year old eagerly tackled it without trouble. 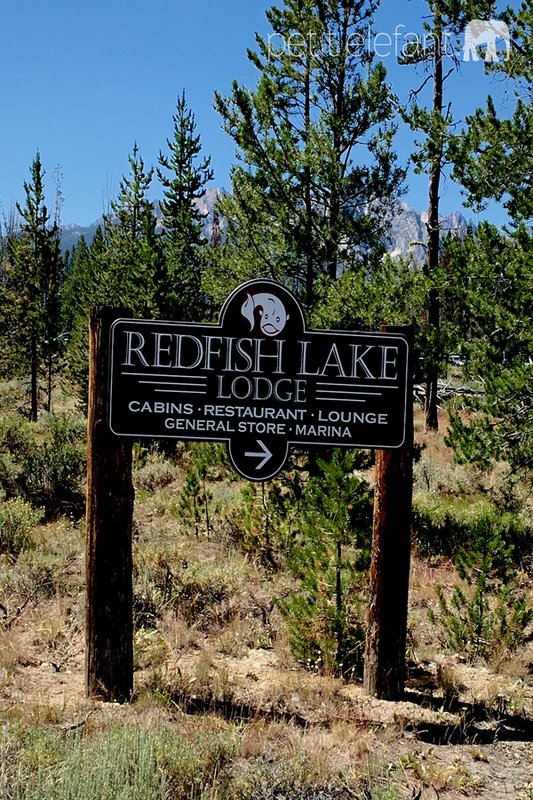 Nearer the lodge and main road, the Redfish Lake Trailhead leads to several other day hikes and stunning viewpoints. We spotted all kinds of wildlife and little critters along the Fishhook Creek trail; dragonflies, chipmunks, deer, rabbits, frogs. 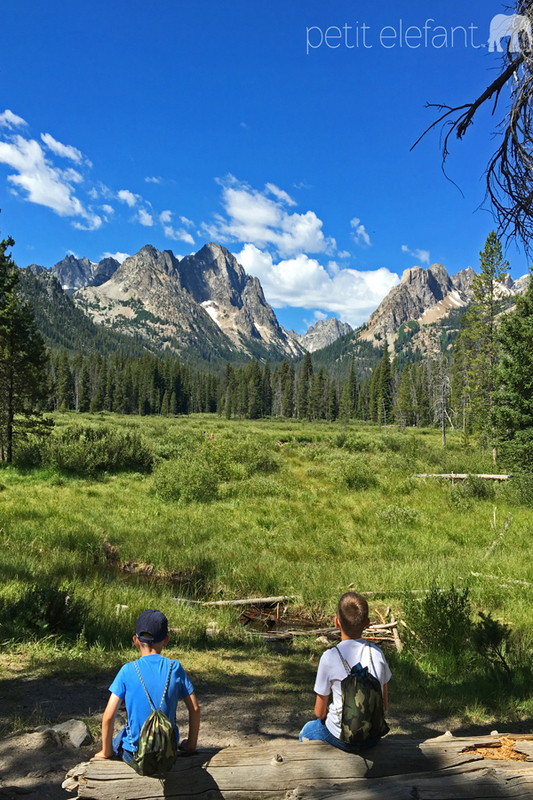 Finally coming out upon the meadow and the saddle of the Sawtooth Mountains took my breath away. It’s all just so beautiful and amazing. Even prettier than the pictures, and ever so much larger. 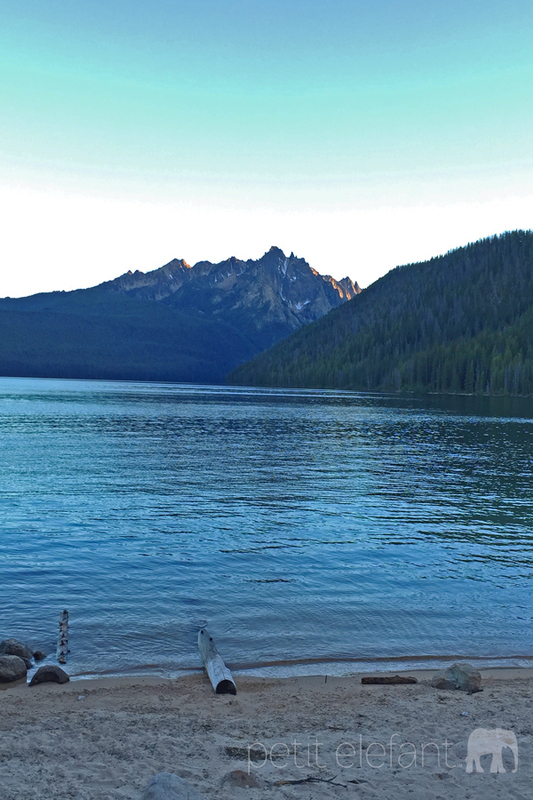 Redfish lake is more than just a campground in the Sawtooth National Forest. A short walk along the shoreline from most campsites is the Marina, and the Lodge with guest rooms, a bar and a restaurant serving meals all day. We took most of our meals homemade by the campfire–because tinfoil dinners are delicious on a camp trip, but did grab breakfast at the lodge our last morning. Reasonable prices, hearty portions, and very tasty. The pancakes were especially impressive–thick and fluffy. Don’t be fooled by these ties to civilization–the atmosphere and vibe throughout the area is very very casual, relaxed and rugged. 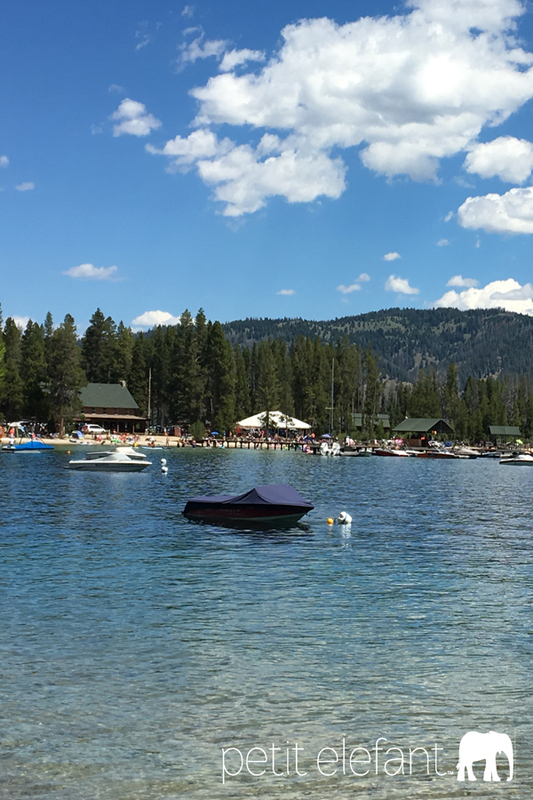 Just beyond the lodge is a little General Store–a beloved hotspot for cold sodas, good looking Redfish Lake t-shirts and hats, snacks, fishing gear and the like. It’s always hopping. Same goes for their outdoor snack gazebo–burgers and fries, beer, and $2.00 soft-serve ice creams. For non-campers, there are several little guest cabins nearby, accommodating a range of group sizes. So, you can enjoy the wilderness and still shave your legs every day if that’s how you prefer to roll. There are so many adventures and ways to enjoy this stunning wilderness–on water, on land, on horseback. The kind of place where the kids can just roam wild and carefree chasing chipmunks and skipping rocks. 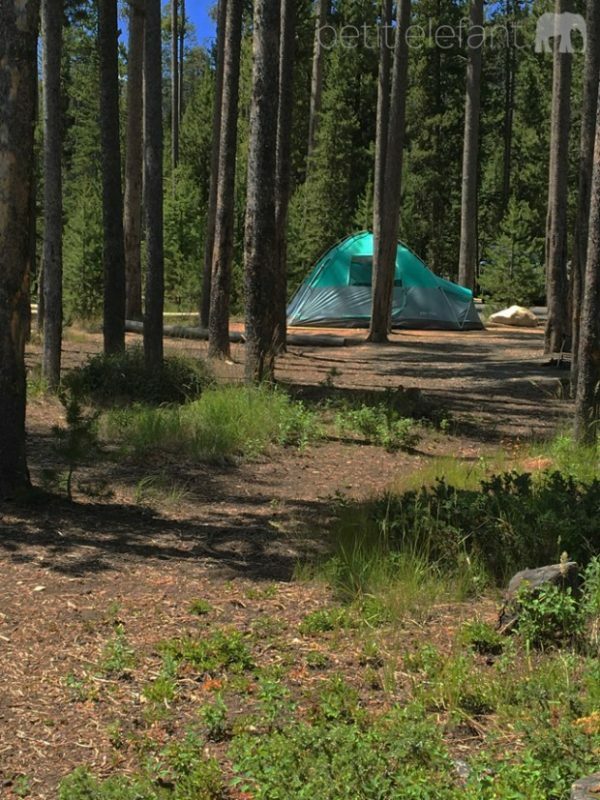 It’s no surprise that cabins and campsites fill up in a matter of minutes when reservations open up, several months in advance. I’m already counting the days until we an reserve for next year. 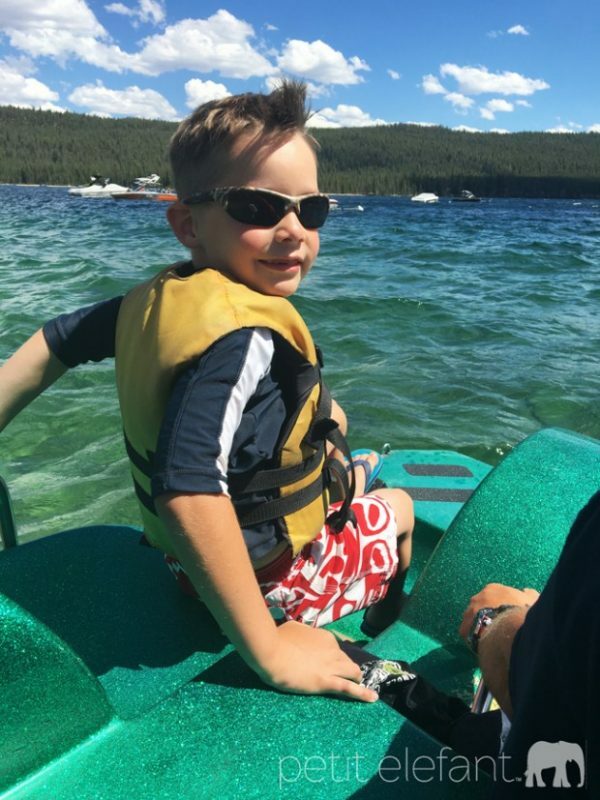 Redfish lake has stolen our hearts. A few tips if you go: Do pack extra layers and socks for chilly evenings and mornings. Summer weekends can be crowded with day-use visitors, while weekdays are a bit more mellow. We did not encounter too many mosquitos, but do bring bug spray and itch reliever. Bring sand toys for the kids, too. The nearby Visitor Center offers evening programs and fun educational activities for kids. 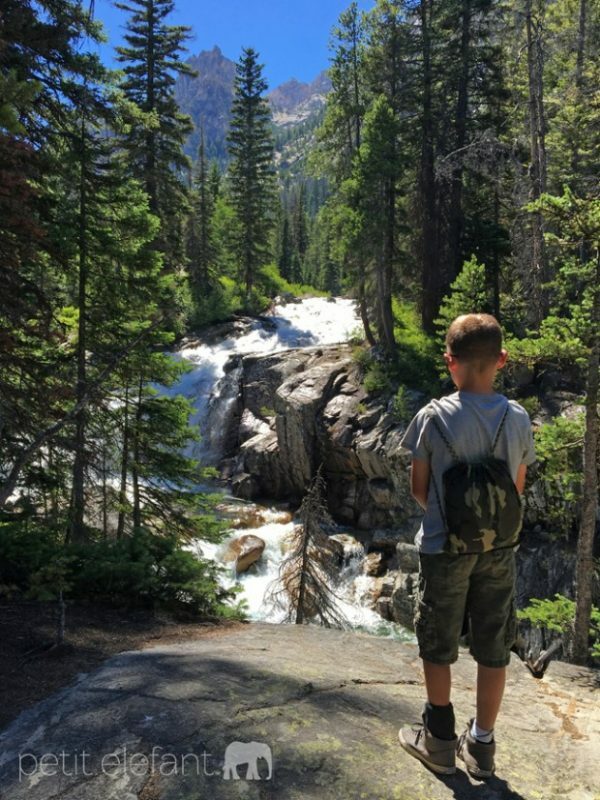 For more favorite family adventures, go here, here and here. NOTE: This post was not paid for or sponsored in any way, by any entity, other than myself, I’m simply happy to share something I love. Just don’t go stealing my campsite for next year.